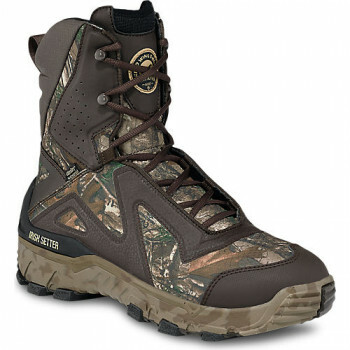 Perfect for late season hunters looking for a lightweight, breathable, insulated boot with superior traction. The VaprTrek™ LS (Late Season) boot is packed with all the features of the popular VaprTrek™ family of boots, but with various levels of insulation and an updated outsole with rubber lugs for traction in the cold. Realtree Xtra® works in any hunting situation with depth and lifelike images. Realtree Xtra® Green offers detail and contrast which works great for early season bow hunting, where green is needed and closeness counts. Realtree AP™ is a neutral, open and realistic camo pattern; everything a hunter needs to be versatile and effective. Realtree APG™ is lighter and more open, neutral-toned, and with more contrast than the competition. The pattern is like Realtree AP, but with olive green accents added. Realtree APG camo offers even more concealment options for early fall and spring. Realtree Hardwoods Green HD® is a "season and region" option for hunters; an ultra-realistic pattern that's effective and versatile for use wherever green is prevalent.